Within the UK there is a growing community of road enthusiasts and there are websites giving details of many of Britain's major roads. Check out the links to get access to these. 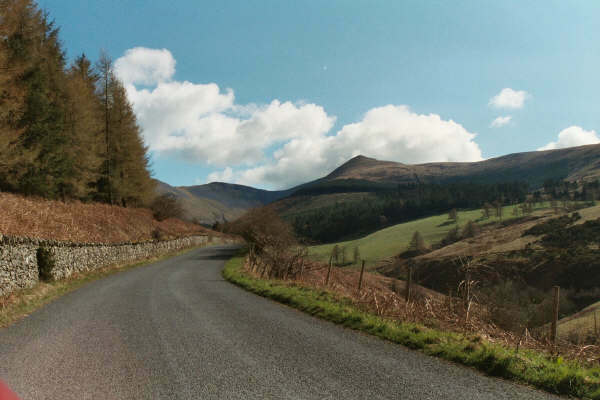 This page is slightly different, in that it makes a tribute to some of Britain's great rural roads, including the Wrynose, Hardknott and Kirkstone passes in the Lake District, the Roads in Dartmoor, the Brecon Beacons, north Essex and Winnats pass in the Peak District. A further update to the Scottish section, with the start of my tour around Loch Ness. Summer has been and gone (you could be forgiven for missing it), but I did manage to find time to revisit a part of Britain I haven't been to in over 10 years - namely Scotland. We were based in Errogie, which is south-east of Loch Ness and eventually there will be a section dealing with the roads in this area. However, we start in Glen Nevis on a wet cloudy day, and move via Neptune's Staircase and the Commando Memorial to Loch Lochy. Have a look here to see the results. It's been a while, but the weather is improving (sort of), and I found myself with a few hours to spare on the fringes of the New Forest. So naturally, I got the camera out, and took the opportunity to drive through Britain's newest National Park. Have a look here to see the results. Click here to find out about previous updates. What is a Rural Road? 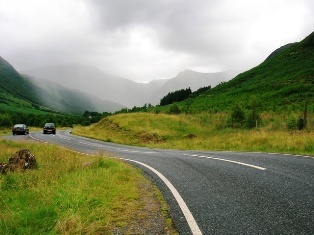 A rural road, in highway engineering terms, is a road that isn't in an urban setting, and, in the case of a new road, is built to the higher standards expected where there is plenty of land around. That is not what this site is about. I am interested in the roads that, by and large, aren't built to any particular standards - they are likely to have evolved gradually over many years from the old pony routes that criss-crossed the country, and any improvements are likely to have been made on an ad-hoc basis. For a road to get on here, it is likely that it is not a strategic route, rather, it is a little out of the ordinary - perhaps because of a feature on the road, or because of the scenery it passes through. If you think that sounds a little vague, it probably is. The main criteria is that I like driving along it. Throughout the site, hover over a picture for a brief description. Clicking on a photograph will open a larger version of the same image.